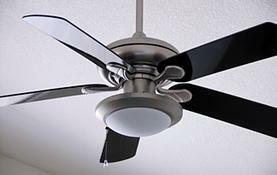 As seen in "MythBusters: Ming Dynasty Astronaut"
Explanation: While there's no record of anyone ever losing his head to a ceiling fan, fear of those whirling blades runs rampant. MythBusters Adam Savage, Tory Belleci, Kari Byron and Scottie Chapman catapulted a dummy into both a household fan and an industrial version to prove whether the breeze makers are really gyrating guillotines. For their test subject, the MythBusters crafted a dummy sporting a humanlike head stuffed with brainlike ballistics gel and pig skull. Then, they constructed a neck out of pig spine and latex arteries filled with fake blood for added authenticity. The weapon of choice was a standard household fan with 52-inch (132-centimeter) wooden blades that turned at a top speed of 26 miles per hour (42 kilometers per hour). The industrial fan — complete with powerful motor and metal blades that whip around at 54 miles per hour (87 kilometers per hour) — did more damage. The blades acted like rotating machetes, slicing straight through the neck, jugular and vertebrae. However, since the dummy managed to escape with his head still attached, the original myth remained busted.